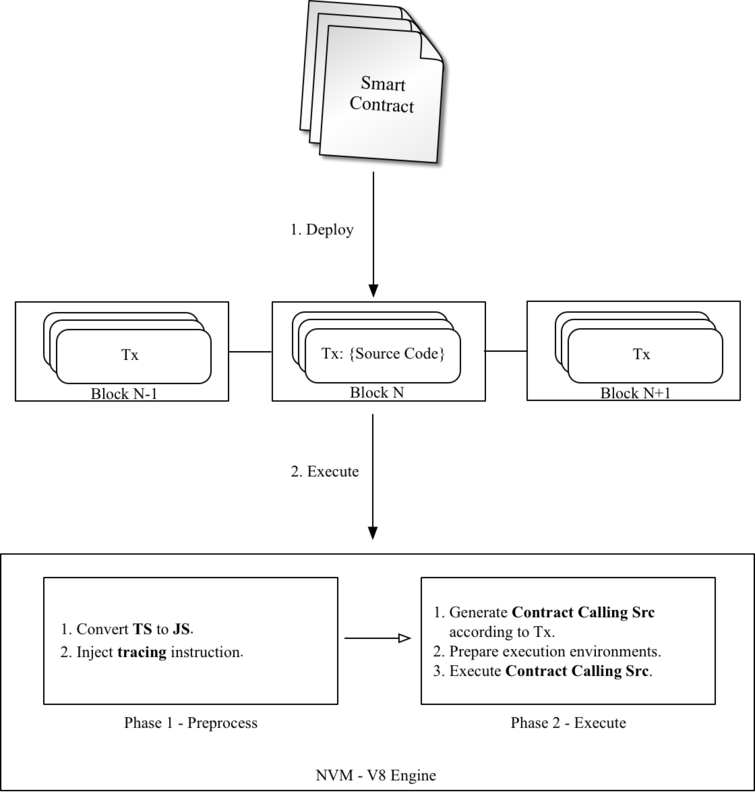 The whole src of the Smart Contract and its arguments are packaged in the Transaction and deployed on Nebulas. Preprocess: inject tracing instruction, etc. Execute: generate executable src and execute it. Contracts in Nebulas are similar to classes in object-oriented languages. They contain persistent data in state variables and functions that can modify these variables. A Contract must include an init function, it will be executed only once when deploying. Functions whose names start with _ are private and can‘t be executed in a Transaction. The others are all public and can be executed in a Transaction. Since the Contract is executed on Chrome V8, all instance variables are in memory, it‘s not wise to save all of them to state trie in Nebulas. In Nebulas, we provide LocalContractStorage and GlobalContractStorage objects to help developers define fields needing to be saved to state trie. And those fields should be defined in constructor of the Contract, before other functions. // define fields stored to state trie. public All functions whose name matches the regexp ^[a-zA-Z$][A-Za-z0-9_$]*$ are public, except init. Public functions can be called via Transaction. private All functions whose name starts with _ are private. A private function can only be called by public functions. The global console can be used without calling require('console'). Print args to Nebulas Logger at level info. Print args to Nebulas Logger at level debug. Print args to Nebulas Logger at level warn. Print args to Nebulas Logger at level error. The LocalContractStorage module provides a state trie based storage capability. It accepts string only key value pairs. And all data is stored to a private state trie associated with the current contract address. Only the contract can access it. // get and return value by key from Native Storage. // return 0 for success, otherwise failure. // define a object property named `fieldname` to `obj` with descriptor. // default descriptor is JSON.parse/JSON.stringify descriptor. // define object properties to `obj` from `props`. // define a StorageMap property named `fieldname` to `obj` with descriptor. // define StorageMap properties to `obj` from `props`. // delete key from Native Storage. // deserialize value by calling `descriptor.parse` and return. // the value will be serialized to string by calling `descriptor.stringify`. // delete key from Native Storage, return 0 for success, otherwise failure. The Blockchain module provides an object for contracts to obtain transactions and blocks executed by the current contract. Also, the NAS can be transferred from the contract and the address check is provided. The Event module records execution events in the contract. The recorded events are stored in the event trie on the chain, which can be fetched by FetchEvents method in block with the execution transaction hash. All contract event topics have a chain.contract. prefix before the topic they set in contract. You can see the example in SampleContract above. Math.random.seed(myseed) if needed, you can use this method to reset the random seed. The argument myseed must be a string. Unsupported methods：toDateString(), toTimeString(), getTimezoneOffset(), toLocaleXXX(). new Date()/Date.now() returns the timestamp of current block in milliseconds. getXXX returns the result of getUTCXXX. this method aims to make it possible to send a binary transfer to a contract account. As to is a smart contact address, which has declared the function accept() and it excuted correctly, the transfer will succeed. If the Tx is a non-binary Tx, it will be treated as a normal function.